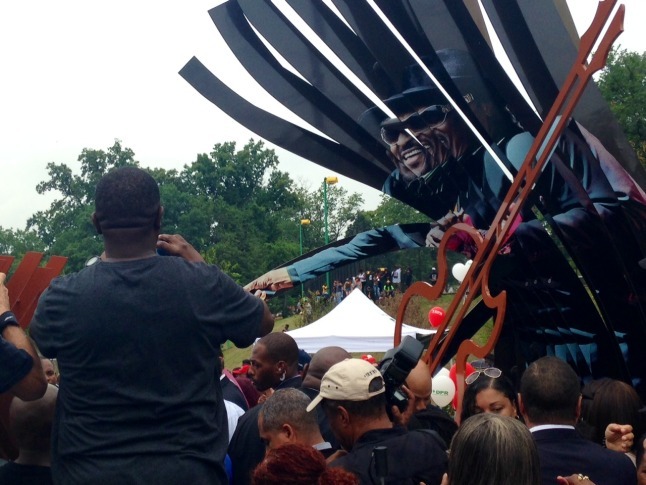 On Chuck Brown Day in D.C., in honor of the Godfather of Go Go, hundreds made their way to a Northeast neighborhood to see the new memorial to the musician. WASHINGTON – On Chuck Brown Day in D.C., in honor of the Godfather of Go Go, hundreds made their way to a Northeast neighborhood to see the new memorial to the musician. “I’m witnessing history,” says Judy Lundy who came all the way across the city on a rainy day for one purpose. “I’m here to honor Chuck. I’m a big fan from all the way back in the ’60s,” she says. Mayor Vincent Gray and other officials welcomed fans to the unveiling of Chuck Brown Memorial Park near Franklin and 20th streets NE. “So many of our monuments are to nationally renowned figures, former presidents. This is a monument to a genuine, local hero, Gray says. A photo wall borders a walkway with a timeline of Brown’s career. It sits adjacent to a metal sculpture featuring the musician. “I love the guitar in the middle. I love ‘Wind me up Chuck’ around the back. It’s beautiful, just beautiful,” says fan Eva Graham. She has five of Brown’s albums and considers herself one of his biggest fans. She was in good company Friday.